I've mentioned before that Hubby and I are trying to eat healthier in order to lose some of the weight we gained while pregnant with Reese. Well, yesterday we were dropping of his vehicle to get new tires and we broke down and went out to breakfast. We reverted right back to our usual ways. Hey, we're human. And boy, does being human taste so good sometimes. Hubby had blueberry pancakes, scrambled eggs with jack cheese, homemade salsa, and sausage links. I had basically my most favorite breakfast ever. My mom used to make it for me before any big event (cheerleading competitions, SAT's, to cure a broken heart) so it always makes me think of home. Corned beef hash with mustard and eggs over medium. They threw in the homestyle fries just for good measure. My mama used to throw in a bagel with cream cheese. Wow, not a diet meal by any stretch of the imagination. Today, we had to get back on track in a big way. 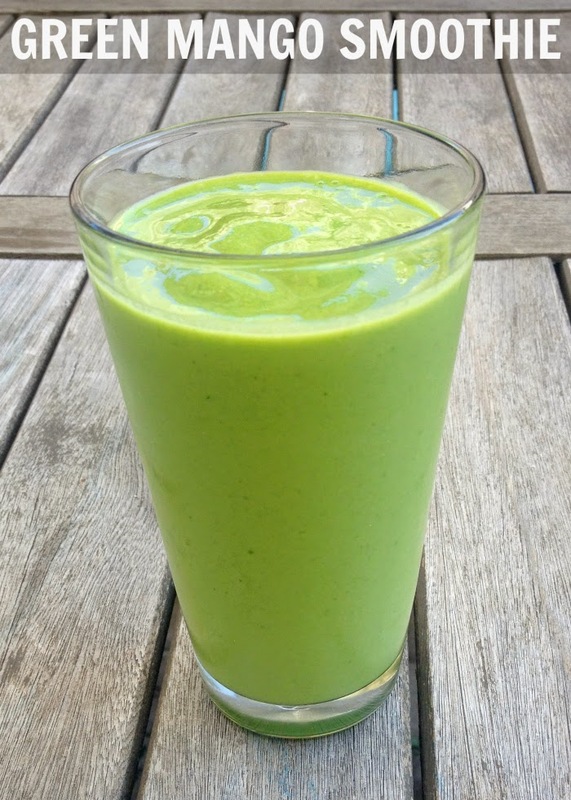 And I thought, what better cool breakfast treat than a green smoothie? This bad boy is chalk full of antioxidants. The color is beautiful, but could be a little off putting. Hubby was excited to hear the blender but when he came over to check out what I was doing he asked me "WHY is it green? What's in it?" I wish the color didn't give away the ingredients because I promise you would not be able to tell by the taste that there is a whole serving of vegetables in these. I always like to keep some frozen fruit, in particular frozen bananas, on hand. The freezer stops the ripening process and I use them in lieu of ice cubes. I already told you we switched over to almond milk but what I didn't tell you Hubby also switched over to Greek yogurt for his on duty lunches. I just snagged one with honey to throw in our smoothies since we were eating them for breakfast and I wanted them to have a little more sustenance. The spinach and the mangoes give you a crazy boost of antioxidants. But I promise, this tastes just like a mango banana smoothie. It is smooth and creamy and totally delicious. Hubby loved them from the very first sip. I guess I can invent recipes after all. Make you and your loved ones this smoothie today! Remove peel from frozen banana and cut into chunks. 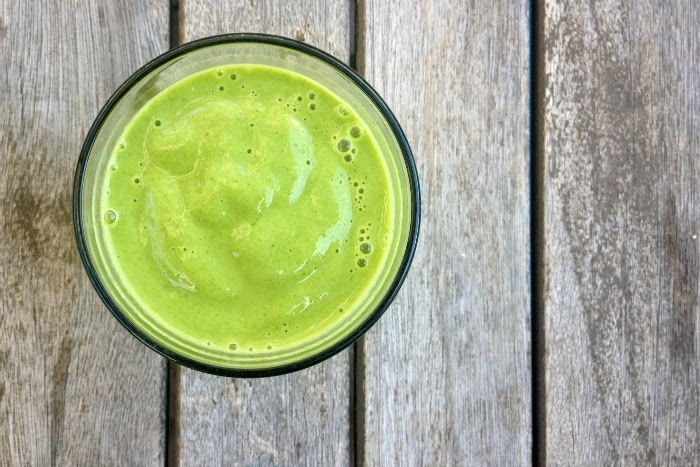 Combine banana, mango pieces, spinach, and almond milk in a blender. Blend for at least 45 seconds to bring ingredients down inside blender. Add yogurt and honey if desired. Blend until smooth and creamy. The smoothie looks delicious, but so do the other sinful breakfasts. Hi there, just came about your blog and love it. That looks super tasty, I would never think out of the blue to put fresh leafy greens in a smoothie. I think I must try it the next time I am in the mood for one. Yum! I must admit I do get a little off put by the greenness of smoothies - but I am trying to over come that free. Green Drinks are a MUST HAVE at my house! Everyone loves them... even my two toddlers (who I may or may not have tricked into believing they are drinking Hulk Juice. Just sayin). OMGsh that is a GREAT idea! Just served my nephew "Hulk Juice" today and he loved it. Genius! !